Do something for the right reasons and nothing can stop you! We live in Martinsville, Indiana which is about 25 miles south of Indianapolis. 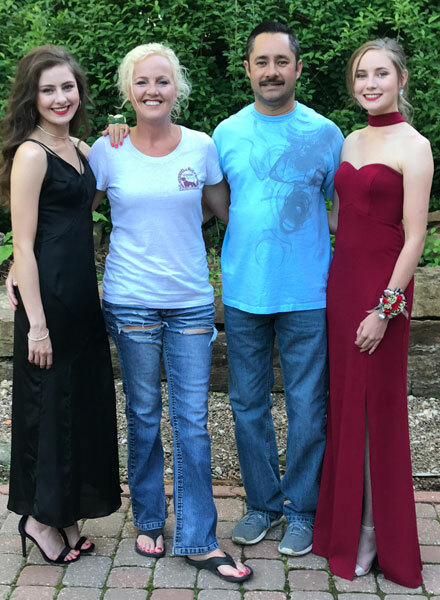 We have two girls, Mikayle and Carlie. We became interested in field trial dogs when we bought our first Vizsla, Duke. We decided to get a Vizsla after lots of research on what breed would fit with our lifestyle. We turned to Vizslas and we fell in love with the breed. Competing with sporting dogs has been a tradition in my family. My late Great Grandfather, Hyatt Doan competed in Fox Hound trials in the late 1960's and was very successful, winning numerous trophies which we cherish today. My Grandfather, Robert White hunted behind English Pointers beginning in his teenage years and continued unil he was 79 years old. I also have cousins and uncles who still hunt with their English Pointers that my Grandfather bred. I tell all of my family members who are hunting with their Pointers that, "life is too short to hunt with an ugly dog!" No honestly I love the looks of a pointer, I just admire the verstility of the Vizsla. Competing in horseback field trials is our family hobby. Although it is a hobby, we work very hard with our dogs so that we can be truly competitive on every level of competition. We have been successful and won on every front of horseback competition. We have been fortunate enough to win futurities, classics, championships and national championships on both the American Kennel Club (AKC) and American Field (AF) side with several different dogs. We are successfully campaigning, breeding and producing NATIONAL CALIBER CHAMPION bird dogs that are companion dogs. We are truly dedicated to the sport and dearly love the quality time we spend with our girls and our dogs. About DuRite: Do Right are important words to us. We believe the best way you can live your life is to try to do right by yourself and others. We believe in improving the field abilities of the Vizsla and our breeding program will reflect a High- Class bird dog with a very sound and charming temperment. We also believe in supporting our puppy buyers. Purchasing a Vizlsa is a big investment from a monetary & commitment standpoint. Therefore a DuRite puppy will always have a written health & hip guarantee. ( See Disclaimer) A DuRite puppy will have a sound temperament that will need consistent nourishment to ensure a stellar personality. We are always available to our clients & breed enthusiast to offer our support. We encourage all of our clients to get involved with their dogs. If a client is willing to campaign a dog in an AKC recognized event and finishes a title DuRite will refund $50.00 per title up to $200.00. We are aware that no dog is absolutely perfect. All animals just like people have flaws. Our breeding beliefs are to minimize any negative qualities & maximize all positive qualities. Our passion is in field dogs so our breeding goal is striving to breed National Championship quality dogs. We at Durite Vizslas guarantee that the puppies will be free of genetic disease(s) until two years of age. If a licensed veterinarian diagnoses such genetic disease(s), DuRite Vizslas will replace the puppy. You may purchase a puppy for many reasons: as a companion, for hunting, showing, or competing in areas such as obedience, agility, or other activities. While we have bred from lines that have had success in many of these endeavors, it is up to you to offer the environment and training for your puppy. We offer a $50.00 refund for each performance title placed on one of our puppies. I.e. JH, SH, MH, FC, AFC, CD, CDX, CH (with a maximum of $200.00 in refunds). Proof of title will accompany a copy of the AKC certificate showing the award for the puppy. CGC is not considered a performance title. We will also refund $50.00 for a copy of the official OFA certificate of the puppy that can be done at two years of age. 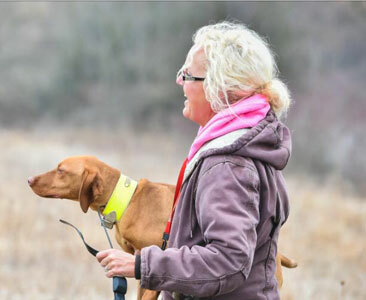 DuRite’s breeding program is striving to enhance the Vizsla’s field abilities and qualities while improving trainability.